Soft Gluten Free Hamburger Buns from GFOAS Bakes Bread | Great gluten free recipes for every occasion. Some may enjoy wrapping your hamburger (or your veggie burger) in a leaf of lettuce, or eating it with a fork and knife. I do not judge you. Far from it! I support you and your bunless tastes. But three years ago, almost to the day, I posted my first recipe for gluten free hamburger buns. I called them “gluten free hamburger buns so I don’t cry,” and I took a stand on my smallest of soapboxes against pretending that it’s all the same—even for those of us who simply want a good, soft gluten free hamburger bun. Especially over the Fourth of July holiday. Fast forward 3 years, and I can’t help but give you the recipe for Soft Gluten Free Hamburger Buns from page 139 of Gluten-Free on a Shoestring Bakes Bread. I want to be sure you don’t go bunless this summer, unless of course you want to. A lettuce leaf might be nice. But it’s no bun. If you’re not ready for the new flours from Bakes Bread, I’ve still got you covered. 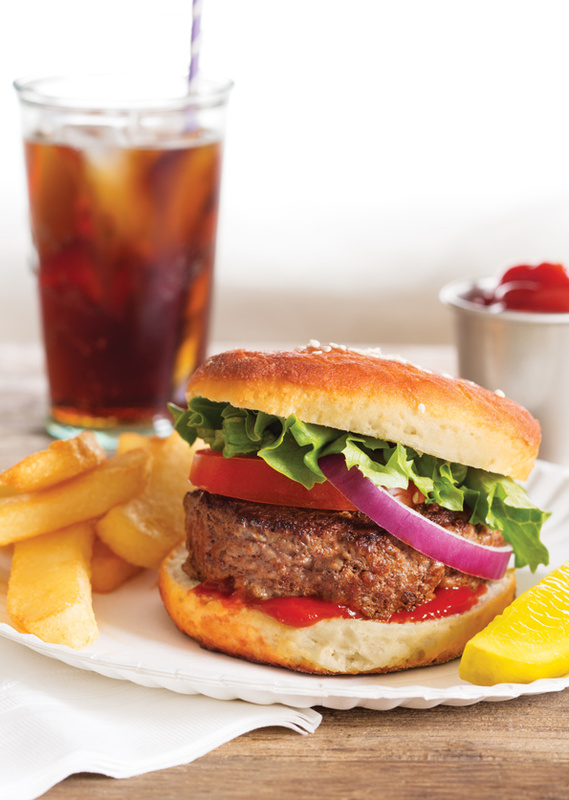 Click through to our recipe for soft gluten free buns for hamburgers and sandwiches. The dough can be made ahead of time, and it just calls for an all purpose gluten free flour blend. The choice is yours! To make the water roux, whisk together the flour and water in a small saucepan. Cook over medium-high heat, whisking constantly, until thickened. It is ready when the whisk leaves a visible trail as it moves through the roux. Remove from the heat and allow to cool until no longer hot to the touch. On baking day, line a rimmed baking sheet with unbleached parchment paper and set it aside. Remove the dough from the refrigerator and turn it out onto a lightly floured surface and, using the scrape and fold kneading method and a very light touch, sprinkle the dough with more flour and knead it lightly, sprinkling with flour when necessary to prevent it from sticking, scraping the dough off the floured surface with a floured bench scraper, then folding it over on itself. Repeat scraping and folding until the dough has become smoother. Do not overwork the dough or you will incorporate too much flour and it will not rise properly. Shaping the buns + the final rise. Place the dough on a lightly oiled piece of unbleached parchment paper and sprinkle the top with flour. Roll out the dough 1/2-inch thick, and with a floured 4-inch biscuit or cookie cutter, cut out rounds. Place the rounds on the prepared baking sheet, about 3-inches apart from one another. Gather and reroll the remaining scraps of dough, and cut out the rest of the rounds. Place the rounds on the baking sheet and sprinkle the tops of the rounds lightly with flour. Cover the baking sheet with lightly oiled plastic wrap, and place in a warm, draft-free location until nearly doubled in size (about 1 1/2 hours). Baking the buns. About 25 minutes before the buns have finished rising, preheat your oven to 350°F. Once the dough has finished rising, remove the plastic wrap, place the baking sheet in the preheated oven, and bake for about 10 minutes. Turn the heat down to 325°F, remove the buns from the oven, brush the tops with the melted butter, and sprinkle with sesame seeds, if using. Return the baking sheet to the oven and bake until the internal temperature of the buns reaches about 185° (another 5 to 10 minutes, no more, so the buns stay soft). Allow to cool for about 10 minutes before slicing and serving. Photo credit Stephen Scott Gross Photography. Food styling by Treva Chadwell. P.S. Do you have your copy of Gluten Free on a Shoestring Bakes Bread? Thank you thank you thank you for playing such an important part in this, the Gluten Free Bread Revolution! Tell everyone about it!! Nicole you are awesome!!! I have made many of your wonderful recipes and we love them. Most recent was the honey bread, so great as a PB&J sandwich. I have a bit of a problem though. I an also intolerant of yeast. So any of you bread/yeast recipes are off limits to me. UNLESS….you can help me with what and measurement’s for replacements. Or maybe some of the wonderful people on here have already and can pass it on to me. Thank you so much for all you do. So, I just made these and the hot dog rolls for the first time this weekend. It was with the dough that was in the refrigerator WAY past the 5 days. They did not brown like yours did. I had to put broiler on to get tops to brown. So tops are crispy instead of soft…no big deal. They are a little over done, but I think they will be just fine. I sliced each one to individually wrap and then freeze in a bag, and insides appear moist on all. I will let you know how they are when we actually eat them.! Changes at work yet again making my life more insane. I was given an attorney notorious for late filings, meaning late nights. In order to get through, I will now have to devote 1 weekend day to cooking and baking for the week! Update…they were just a smidge dry and I think that was because they were not baked on time and cooked longer because they were not browning. They tasted great though! You are so good to us! Happy 4th of July week! Even my kids call the Gluten Free Burger Buns So I Don’t Cry by their full title, as I make them all the time, and always refer to them that way. Love that recipe! I am also a fan of these guys from the new book, so our burgers will have buns on the 4th. I personally think a lettuce leaf belongs in a salad, so I am in the knife and fork camp if I have to go bunless. Is that a word? I guess it is now! when you go “bunless”…. hahahaha!